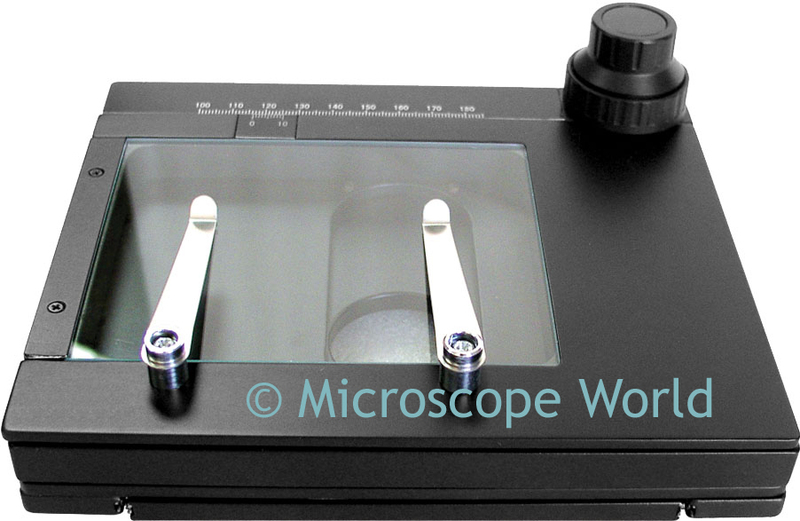 Microscope stages and stage plates can get fairly messy from examining biological or industrial specimens. Cleaning these items with a lint free soft cloth and a solution of mild soapy water works best. Don't use an overly wet cloth since moisture may seep into the stand which may have electronics inside. Always unplug equipment before attempting to make repairs or to perform cleaning. Do not use alcohol, acetone or other solvents on your instrument as they may cause damage to painted surfaces. For glass stage plates, we recommend using mild soapy water and your bare hands. Have a soft paper or cloth towel to set the glass on after you've washed and rinsed your glass. Carefully dry the glass. It can be a bit damp so let the air dry the glass completely. If you used distilled water, the glass will dry without leaving mineral deposits. Next, by holding the glass by the edges, drop the glass back into the stage and tighten down the locking thumbscrew. Use any aerosol spray product, no matter who sells it or what their claims are. Use eyeglass lens tissue, toilet paper or other paper. It DOES scratch glass! Use pre-packaged cotton balls. Most of the time they are NOT made from cotton. Use lens cleaning solutions marketed by resellers using their brand name. Making your own cleaning solution is cheaper and more effective.